This week the spotlight is on Dr Lucie Green, Royal Society University Research Fellow, UCL Space and Climate Physics (the UCL Mullard Space Science Laboratory). I study the Sun's atmosphere as a Royal Society University Research Fellow. Specifically, I look at the incredible eruptions of magnetic field and electrically-charged gas that regularly occur. These eruptions were only discovered in the 1970s when telescopes in space transformed our view of the Sun. Since then, we have learned that these eruptions can race out into the Solar System and engulf the Earth. The Earth's magnetic field gets distorted when this happens and a chain of events takes place that can ultimately end in problems with our electricity distribution, communications and navigation systems. Living so close to a dynamic star really means something for us. My interests are broad though. 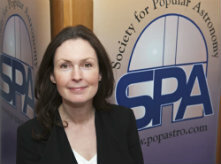 I run my department's public engagement programme, am Chief Stargazer at the Society for Popular Astronomy and can frequently be found on TV or radio. I am also one of the governors of the UCL Academy. For me, a university should be an open and active part of the wider education community and the academy and public engagements are a fantastic opportunities to make this happen. I have worked at UCL for the past nine years now - although I also did my PhD in solar physics here. Between completing my PhD and coming back to UCL, I worked on the Faulkes Telescope Project, which gets school students doing their own astrophysical research using professional telescopes that are robotically controlled over the internet. It's a fabulous project that perfectly encapsulates my view that you can be a scientist no matter how old you are. There is something for anyone who is interested and motivated. I was a founder member of the team (with Sally MacDonald and Julia Abbott) that successfully bid for UCL to become a Beacon for Public Engagement and a leading university in communicating their research. The new Public Engagement Unit that was subsequently established has been incredibly successful and their work and the culture change within UCL are growing all the time. The work that I am doing with my PhD student, Stephanie Yardley, is very exciting because we are looking into fundamental processes that happen in the solar atmosphere that lead to eruptions of magnetic field and gas known as coronal mass ejections. We aim to be able to show, conclusively, how the magnetic field is observed to evolve, which will finally tell us why these eruptions occur. It's research that is also important for the next solar physics space mission, Solar Orbiter. This spacecraft will be launched in a few years time by the European Space Agency and it will travel close to the Sun so that these eruptions can be studied up close. My engineering colleagues at UCL are currently building instruments to go on this spacecraft and it's a very exciting time. Tori Amos - Little Earthquakes. Any film by Pixar (except Cars). Any novel by Nick Hornby. What did the Sun wear to the disco? Solar flares! They would have to include my UCL colleague Professor Lidia van Driel-Gesztelyi, around whom there is never a dull moment. If I can bring back the dead then I would have to invite Cecilia Payne-Gaposchkin who discovered, in 1925, that the stars, and therefore most of the visible universe, are mostly made of hydrogen. She was also known for her wit and was a great storyteller. Then, for pure eccentricity, I would have Tycho Brahe, a great 16th century astronomer who was the life and soul of every party he attended. Hopefully, he would bring his elk. Don't let men do all the talking - believe in yourself. When I left school I studied art and wanted to become an art therapist. I was fascinated that art had so many valuable roles. It's a way for everyone to explore the world around them, but it also has great value for psychotherapy and as a way to develop the basic coordination skills that most of us take for granted. But my love of physics turned out to be stronger than my love of art, so I went to the University of Sussex to read physics with astrophysics. Esperance in Western Australia. Amazing beaches and Skylab.